I became a big fan of Navigon about ten years ago. Their software and hardware was ahead of the rest. That included Garmin, TomTom and Magellan. There must have been something to it because Garmin purchased Navigon in 2011. They quickly discontinued Navigon hardware but integrated some of their unique software features into today’s GPS, especially around the traffic views on the Garmin Nuvi and Drive GPS. Although you can’t buy a new Navigon GPS, you can purchase their iOS or Android apps. I see the iOS app available for around $50. Never tried it as I’m a fan of Waze on a smartphone. 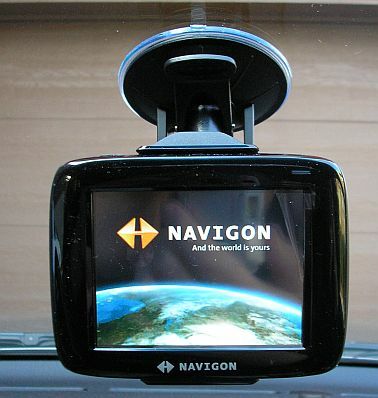 Navigon made several GPS models including the 2000S, 2090S, 2100, 2120, 2200T, 5100, 7200T and 8100T. When you purchased a Navigon GPS, they provided some of the strangest mounts I had ever seen. I had two Navigon GPS devices. One of them was a 7200T which had a mount that resembled a small hockey stick. I also had a 2100 which had another proprietary mount. That’s a photo of my old Navigon 2100 with the stock mount that came in the box. Can’t buy them anymore. While the bad news is that these mounts can no longer be purchased, the good news is that there are some universal options that will work nicely. Let’s look at some mount options for a Navigon GPS. Be sure to measure your GPS prior to purchase to make sure it will fit within the cradle. The interesting thing about universal cradles is that most are marketed towards phones these days. Navigon was ahead of their time in hardware and most of their models were fairly close to smartphones in dimensions so a phone mount will work fine here. Most like to mount a GPS on a windshield so let’s start with that. A well made expandable mount is the Arkon Slim Grip Ultra Travel Mount. This mount features an expandable cradle which expands to over 7 inches using a spring-loaded top and bottom. The support arms move so that you can expose any ports or buttons. This will fit what I believe to be all Navigon models from the sides of the device. The mount comes with an adhesive dash plate so that you can attach the mount to your dash as well as the windshield. The mount swivels and pivots. A 2-year warranty comes with this mount. That same cradle is featured in the Arkon Friction Dash Mount with Slim Grip Ultra Cradle. The included bean bag weighted dash mount weighs almost two pounds and has a safety anchor which I suggest using. The device can swivel 360 degrees and will pivot and tilt. As mentioned, this mount features the same cradle as the windshield mount which opens to over 7 inches. Plenty large enough for your Navigon GPS. A 2-year warranty comes with this mount. On a motorcycle, consider the Arkon RoadVise Handlebar Strap Mount. The grips are padded to prevent marring and opens to 4 inches. So as long as your Navigon GPS is less than four inches, this will fit well. The included handlebar mount is constructed of plastic and fits bars up to almost 2 inches diameter. The ball and socket design allows full swivel for your device to be used in landscape or portrait mode. The mount is easy to install and remove. We always like to recommend adding a tether to any motorcycle mount, you can read about them here. Any of these three mounts should work as well as the ones received with the Navigon.